Fellow Svengoolie SvenPals everywhere will be excited about his upcoming showcase of a cult classic sci-fi/fantasy/comedy feature from one of cinema’s cult sci-fi film directors. The legendary Berwyn/Chicago based-sci-fi film host will present his big coast-to-coast broadcast premiere of “Village of the Giants” (1965), this Sat., Jan. 12 at 8 p.m. Eastern/7 p.m. Central on Me-TV. “Village of the Giants’ (1965) was directed by cult sci-fi film director Bert I. Gordon. Gordon also directed “King Dinosaur” (1955), “Beginning of the End” (1957), “The Amazing Colossal Man” (1957), “Attack of the Puppet People” (1958), “War of the Colossal Beast” (1958, the sequel to “The Amazing Colossal Man”), “The Magic Sword” (1962) and “Empire of the Ants” (1977). Gordon’s “Village of the Giants” (1965) was loosely adapted from H.G. Wells’ novel, “The Food of the Gods” (according to Jeff Stafford’s article on Gordon’s 1965 feature for Turner Classic Movies). The adaptation was written by Gordon and Alan Caillou. Nine years after “Village of the Giants,” Gordon directed a true adaptation of Wells’ “The Food of the Gods” (1976, for American-International Pictures). 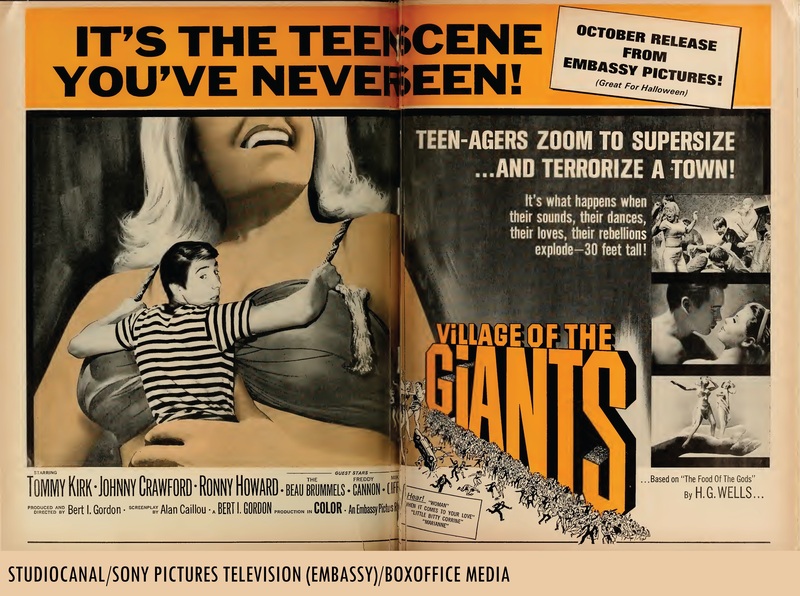 “Village of the Giants” was released theatrically by film distributor Joseph E. Levine and his independent/art-house distribution firm, Embassy Pictures in 1965 (according to IMDB). Sven previously aired “Village of the Giants” on his hometown television station in Berwyn/Chicago, WCIU-TV 26/”The U” in Sept. 2008 (according to additional details from IMDB). Who was in “Village of the Giants” (1965)? The players who appeared in Gordon’s 1965 fantasy feature were Ron Howard/Ronny Howard (as Genius), Tommy Kirk (as Mike), Joy Harmon (as Merrie), Beau Bridges (as Fred), Toni Basil (as Red), Johnny Crawford (as Horsey), Freddy “Boom Boom” Cannon (as himself), The Beau Brummels (as themselves), Rance Howard (as a deputy, he was Ron’s real-life father), Charla Doherty (as Nancy), Robert “Bob” Random (as Rick), Tisha Sterling (as Jean), Tim Rooney (as Pete) Gail Gilmore (as Elsa), Joe Turkel (as a sheriff), Hank Jones (as Chuck) and feline film star Orangey (of 1951’s “Rhubarb” and 1955’s “This Island Earth” fame in an uncredited role as a giant cat). 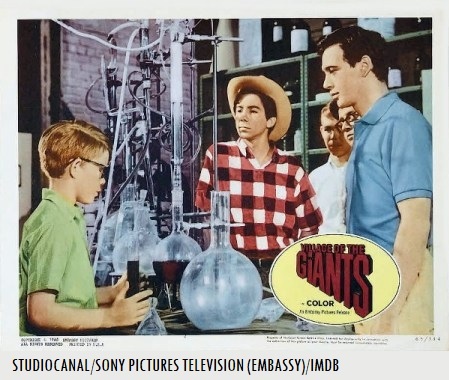 Original Embassy Pictures lobby card/publicity still for “Village of the Giants” (1965), with Ron Howard, Johnny Crawford and Tommy Kirk. Ron Howard’s best-known acting roles include his characterizations of Opie Taylor on “The Andy Griffith Show” (1960-68) and Richie Cunningham on “Happy Days” (1972-80, with guest appearances in 1983 and in the 1984 finale). Howard became successful film director; some of his works include “Grand Theft Auto” (1977), “Splash” (1984), “Apollo 13” (1994) and “A Beautiful Mind” (2001). Beau Bridges went onto greater fame for his appearances in “The Last Picture Show” (1971), “Norma Rae” (1979, with Sally Field) and “Stargate: SG-1” (in the remainder of the series from 2005-07). Toni Basil went on to greater success as a dancer, choreographer and singer; one of Basil’s best-known hit songs was “Mickey” (1981). Freddy “Boom Boom” Cannon’s portfolio of hit recordings include “Tallahassee Lassie,” “Way Down Yonder In New Orleans” (both 1959), “Palisades Park” (1962), “Action” (1965) and his most recent hit song with Svengoolie, “The Svengoolie Stomp” (2016). The Beau Brummels’ hits were “Laugh, Laugh” (1964) and “Just a Little” (1965). One of Johnny Crawford’s notable roles was his role of Mark McCain on “The Rifleman” (1958-63, with Chuck Connors). Tommy Kirk appeared in many of Walt Disney’s live-action features, including “Old Yeller” (1957), “The Absent-Minded Professor” (1961, with Fred MacMurray) and Disney’s Technicolor adaptation of “Babes in Toyland” (1961, with Annette Funicello). 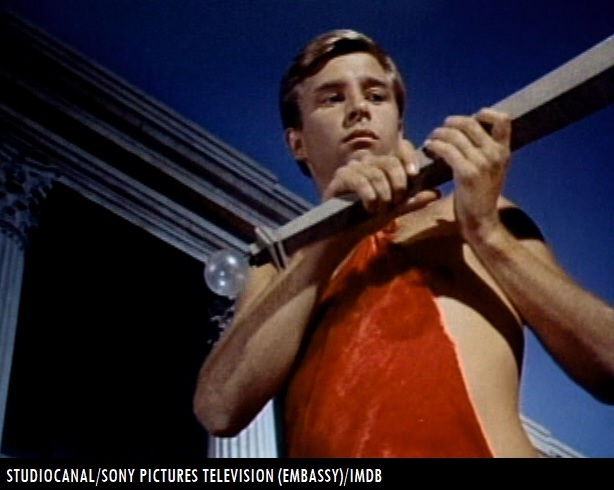 Beau Bridges in Bert I. Gordon‘s “Village of the Giants” (1965). According to IMDB, exterior scenes for Gordon’s “Village of the Giants” (1965) were filmed at Columbia Pictures’ Burbank ranch lot (many outdoor sequences for various Columbia films and Screen Gems TV productions were filmed at the Burbank ranch) and at Universal Studios’ “Courthouse Square” in Universal City (featured in the 1964 film adaptation of “To Kill a Mockingbird” and in Universal’s “Back to the Future” film trilogy series in 1985, 1989 and 1990). From “Mystery Science Theater 3000” ep. #523, “Village of the Giants;” featuring host Mike Nelson, the vocal stylings of Kevin Murphy (as Tom Servo) and the vocal stylings of Trace Beaulieu (as Crow T. Robot). Gordon’s 1965 Embassy sci-fi/fantasy feature was riffed on “Mystery Science Theater 3000” (ep. hosted by Mike Nelson), which was broadcast on Comedy Central on Jan. 22, 1994. Be sure to watch or record Svengoolie’s big coast-to-coast broadcast premiere of “Village of the Giants” (1965), this Sat. on Me-TV! Svengoolie (portrayed by Rich Koz), Kerwyn and all fellow SvenPals everywhere are excited for his big giant coast-to-coast broadcast premiere of Bert I. Gordon‘s “Village of the Giants” (1965); this Sat. on Me-TV! With Ron/Ronny, Joy, Beau, Toni, Tommy, Johnny, Freddy, the Beau Brummels, Rance, Tisha, Robert, Gail, Joe, Charla, Hank, Joe, Tim and feline star Orangey; you will not want to miss Svengoolie’s coast-to-coast big broadcast premiere of “Village of the Giants” (1965), this Sat. on Me-TV! A fun treat for all fellow super SvenPals from coast-to-coast with Sven’s additional fun facts, Doug Graves’ parody tune and Kerwyn’s “mail call” segment! Highly recommended for all fellow SvenPals! And be sure to rock along with Freddy, the Beau Brummels, Sven and Doug during the big broadcast! –C.H. Live-tweet with all fellow #Svengoolie SvenPals everywhere during his coast-to-coast big broadcast showcase premiere of Bert I. Gordon’s “Village of the Giants” (1965), this Sat. on Me-TV! Watch/record Ron/Ronny Howard as Opie Taylor in two back-to-back episodes of “The Andy Griffith Show,” weeknights at 8 p.m. Eastern/7 p.m. Central on most Me-TV stations! Freddy “Boom Boom” Cannon and Svengoolie’s 2016 smash hit, “The Svengoolie Stomp” is available as a downloadable purchase on Apple’s iTunes, Amazon Music and is also available on a limited edition 7” orange vinyl 45 r.p.m. single from Wondercap Records! Cameo mentions of fellow super SvenPals! (Broadcast after the conclusion of Sven’s Jan. 5 big broadcast of Erle C. Kenton’s 1942 Universal “Frankenstein” feature, “The Ghost of Frankenstein” on Me-TV)! Extra! Extra! Fellow super Svengoolie SvenPals from coast-to-coast jumped for joy during Svengoolie’s “on the road” highlight segment of the Oct. 2018 “Nightmare on Chicago Street” horror/costume/zombie festival event in in Elgin, Illinois; where fellow super SvenPal Nanette Keir had a cameo appearance during Sven’s meet-and-greet autograph/photo session at the event! 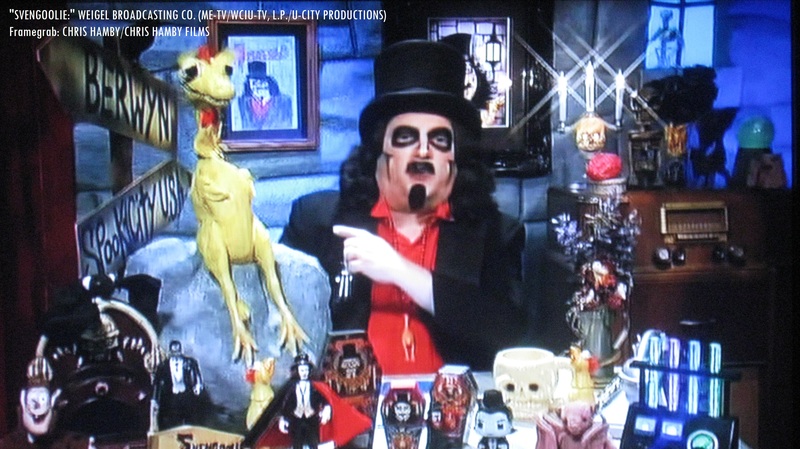 Congratulations from the entire crowd of fellow coast-to-coast super Svengoolie SvenPals, Nanette on seeing Sven in-person and for your cameo appearance in Sven’s recent “on the road” segment! All of us fellow super SvenPals are glad to hear that you enjoyed seeing Sven in-person and we’re all proud of you! -C.H. Help one one of our fellow super SvenPals’ friends! Give generously/spread the word to help out a friend of fellow super SvenPal Jamie Lee from the PM&L Theatre ensemble, via her friend’s official “GoFundMe” website to help offset expensive costs of additional medical-related treatments. Again, be sure to spread the word/donate generously to help one of Jamie’s friends! –C.H. Questions/comments about “Svengoolie” and/or “Village of the Giants” (1965)? Drop a line in the comments section!